Earlier today, I logged onto my Facebook account and saw an ad for what looked eerily like the Ford Focus I sold after I moved to the city. I wiped my glasses clean (just to be safe), and looked again. 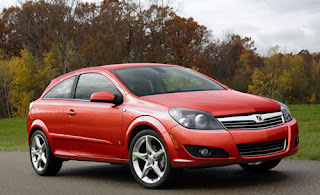 It wasn't a Focus, but in fact the new 2008 Saturn Astra. The Astra is all new, in America at least (the Opel Astra has been competing with the VW GTI and other hatchbacks in Europe for some time). The specs page wasn't loading all the way when I tried to check it out, but according to Edmunds.com, the Astra is going to have a 140-hp, 1.8L 4-cylinder motor and will be available as a three- and five-door hatchback. Saturn is playing up the driveability of the car, offering up 18" wheels and "sport seats" on the three-door. What do I think? Well, I love small, "tossable" cars. With 140-hp, it's not the most powerful sport hatch on the market, but I've always appreciated handling over sheer power. Design-wise, I think it looks a lot like my old Focus, but with the signature Saturn bug-eye headlamps. I don't think it will set any records, but will be a good choice for someone looking for a car with a lot of reliability, good economy, and a little sport. Just like my Focus. Nice post on the Astra. Not sure how I feel about Saturn advertising on Facebook, but hey, I guess everyone else is! Yeah, I'm not really a hatchback fan at all, but seeing the Astra in person at the North American International Auto Show started to change my opinion. I must say, however, that the interior is lacking. Adam, thanks for your input. It's great to see such strikingly honest criticism from an employee of the company that produces the product being discussed.